Try our riff on the classic Quiche Lorraine Au Fromage. 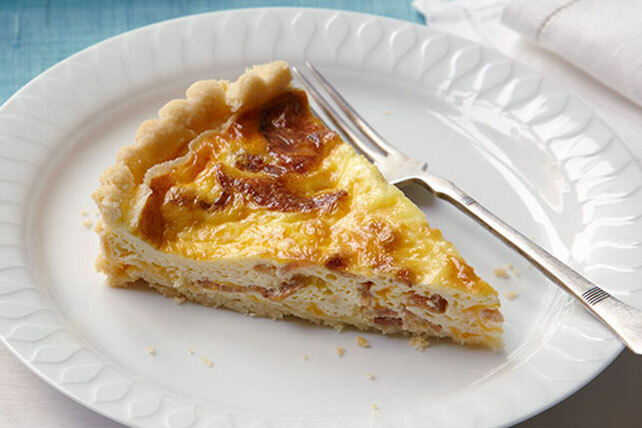 Serve up this Quiche Lorraine Au Fromage for French-inspired brunches and parties. Mix flour and salt in medium bowl. Cut in butter and shortening with pastry blender or 2 knives until mixture resembles coarse crumbs. Add ice water, 1 Tbsp. at a time, mixing lightly with fork until dry ingredients are evenly moistened and mixture clings together when pressed into ball. (If necessary, stir in more ice water, 1 tsp. at a time, until dough sticks together.) Flatten dough to 1/2-inch-thick round on large sheet of plastic wrap; wrap securely. Refrigerate 20 to 25 min. or until well chilled. Roll out dough on lightly floured surface to 13-inch round. Place in 9-inch pie plate; fold under and flute edge. Sprinkle bacon and cheese onto bottom of crust. Whisk eggs and half-and-half until blended; pour into crust. Bake 15 min. Reduce oven temperature to 350ºF. Bake 35 to 40 min. or until knife inserted in center comes out clean. Let stand 10 min. before serving. Serve this flavorful quiche with smart sides, such as a fresh fruit salad and glass of low-fat milk. Substitute a 10-inch quiche dish for the pie plate. Prepare as directed, reducing the final baking time to 25 to 30 min. or until knife inserted in center comes out clean. Quiche can be made ahead of time. Cool just to room temperature before serving.